The Panama-Pacific International Exposition was teeming with music. Its concert calendar included appearances by some of the nation’s most renowned musical ensembles, including the Boston Symphony and Sousa’s Band; concerts on the exposition’s mammoth organ, which comprised some 6,500 pipes; and a stream of famous singers and instrumental soloists, choral groups, military bands, and performers from exotic climes. Popular music was flourishing as a colossal industry at the time, with sheet music sales near an all-time peak even as phonograph records began to displace the parlor piano as the prime means of conveying popular music. Dozens of songs and instrumental pieces celebrating the P.P.I.E. sprang into existence, their popularity benefiting from the nation’s obsession with the fair while providing a barrage of publicity and boosterism in return. 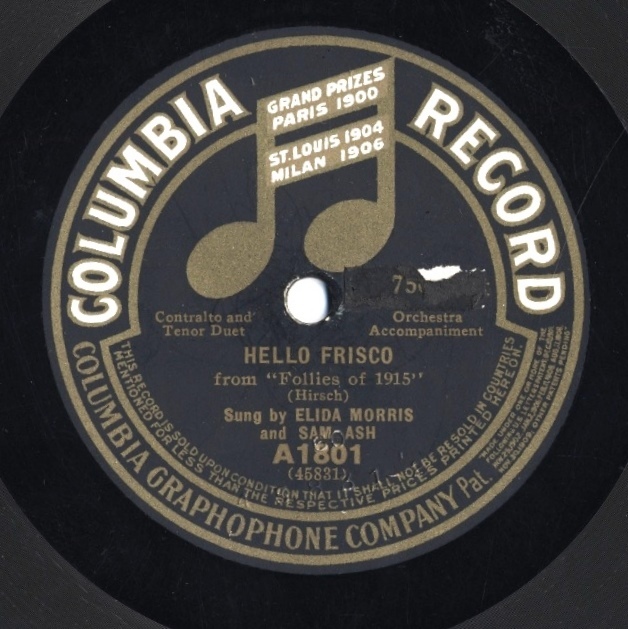 One of the top-selling recordings of 1915 was a Victor release by the concert singers Olive Kline and Reinald Werrenrath of “Hello, Frisco!” (lyrics by Gene Buck, music by Louis A. Hirsch), introduced that year in the Ziegfeld Follies. It spent ten weeks at the top of the Billboard chart, a sales-monitoring tool that magazine had established two years earlier. In the song, two lovers—one in New York, the other in San Francisco—make use of the newly established transcontinental telephone service to exchange sweet nothings. It was a topic of great fascination to Americans just then, as the official inauguration of coast-to-coast long-distance service had been timed to coincide with the opening of the P.P.I.E., in January 1915. Scroll down to hear “Hello, Frisco!” and other songs written for the P.P.I.E. Few songwriters could hope for the magnitude of commercial success “Hello, Frisco!” achieved. In fact, most of them could not realistically expect their P.P.I.E.-related songs to make much impact at all, let alone graduate from sheet music to sound recordings. Of the 17 sheet music covers included here, a handful were issued by the songwriter himself —essentially “vanity publications” of the sort that could be produced at the corner printing shop—or by strictly local enterprises (such as the Florintine Music Company of San Francisco or the Southwest Music Publishing Company of Oakland) that were a small step up in mercantile standing. Even in these cases, one can only be impressed by the effort songwriters put into the presentation of their minor masterpieces. At the other end of the spectrum, several firms of more widespread prestige issued sheet music pegged to the P.P.I.E. Here we see such examples as Norman Studer’s “Panama Pacific Exposition March,” released by the regional Homer Tourjée Publishing Company of Los Angeles, and Leo Friedman’s “Exposition March San Francisco 1915,” from the Chicago firm of Frank K. Root (whose uncle, George F. Root, had published some of the most famous songs of the Civil War). Scroll down to hear “San Francisco (At That San Fran Pan American Fair)” and other songs written for the P.P.I.E. ~ James M. Keller, the long-time Program Annotator of the San Francisco Symphony and the New York Philharmonic, curated the exhibition Singing the Golden State, which ran at the Society of California Pioneers in 2012-13 before embarking on a statewide tour of regional museums.